UNITY AGAINST capitalism and war was the central theme of the Socialist Alliances second national conference, held in Melbourne on May 10-11. Some 120 delegates representing more than 900 financial members in 24 branches debated how to build on the Alliances first two years of existence. There were 160 observers. It was so fantastic to meet such a broad range of people. The respect delegates showed for one another was one of the most positive things, said Angela Budai, an organiser with the Finance Sector Union and a delegate from the Northside branch in Sydney. Two main resolutions were put forward. The first was based on an open letter signed by more than 150 non-aligned membersmembers not part of one of the eight socialist groups affiliated to the Alliance. It was supported by the Democratic Socialist Party. The motion called for the Alliance to begin the process of becoming a united, multi-tendency socialist party that would respect diversity but speak with a common voice. The second resolution was moved by the International Socialist Organisation (publisher of Socialist Worker) and the Freedom Socialist Party. It argued that the crisis in the ALP was central to the Alliance project. To win over many of the hundreds of thousands of people breaking from loyalty to Labor, the Alliance had to be welcoming to both revolutionaries and non-revolutionaries. The Alliance also needed to put a special emphasis on elections, fighting for the kinds of values Labor had abandoned. Between elections, the Alliance should support or initiate campaigns, particularly to help rebuild the union movement. The first resolution won 90 votes and the second, 27. The debate was less polarised than the vote would suggest. Many supporters of the open letter emphasised that they wanted the Alliance to remain inclusive and broad and not to become an activist, far left party. The one thing that clearly united them was the desire to see the Alliance grow and become stronger. Later in the conference, non-aligned members frequently voted different ways on different questions. Craig Johnston, former AMWU Victorian state secretary and a delegate from the Melbourne West branch, supported the open letter resolution. But he also spoke for an amendment moved by ISO member and Melbourne North-East delegate Patrick McLiesh that aimed to delete any notion that affiliates would be subject to compulsion. He told Socialist Worker later We need to expand outside the affiliates. The Alliance needs to be broad and democratic, and open to people coming from all kinds of socialist backgrounds. Weve got to attract a lot of those disillusioned ALP type of voters and try to win them over to a stauncher program. After this conference, Ill be going to a lot of activists in the AMWU and other unions to ask them to join. lTo read the ISOs document for the Alliance conference, visit www.socialist-alliance.org and click on debate. DEFENDING and strengthening the unions was an important element of the conference. Martin Kingham, Victorian secretary of the CFMEU construction division, received a warm welcome when he gave greetings to conference. Delegates adopted a resolution moved by ISO member Lauren Want (Queensland) calling for active solidarity with the construction unions in the face of the Cole royal commission, and affirming solidarity with the Skilled Six, AMWU members facing charges. In coming months, Alliance branches will organise public meetings in every city defending the construction unions, involving a broad range of union members, and Green and Labor members. Delegates also voted to call a similarly broad-based solidarity lobby of the ACTUs congress in Melbourne in August. The conference adopted a substantial resolution on union work, which encouraged the establishment of local Alliance union committees. Former AMWU secretary Craig Johnston successfully moved an amendment calling for the Alliance to run education and training for unionists. Angela Budai told Socialist Worker The door is open for the Alliance to have a real impact on peoples working lives. The Workers First group in the Victorian AMWU ran a hugely successful welcome for conference on the Saturday night, introduced by Steve Dargavel, Victorian secretary of the metals division. Officials and members from the LHMU, TCFUA, ETU, CFMEU, MUA and the printing and food divisions of the AMWU attended. Workers First presented the Alliance with $500 the next day. CONFERENCE adopted positions on relations with Greens and Labor. Delegates welcomed the rise of the Greens as a reflection of the growing mass rejection of the policies of economic rationalism and war. They voted to pursue close collaboration with the Greens, including in election campaigns. On Labor, delegates agreed it was important to relate to that partys crisis. The resolution noted that This cannot be done simply by denouncing Labor; we also need to find ways to work alongside those still in Labors orbit. Alliance branches will be looking to invite Labor members or MPs on to joint platforms around questions like Medicare and defending the construction unions. l Delegates called for an end to the occupation of Iraq and self-determination for minorities including the Kurds. 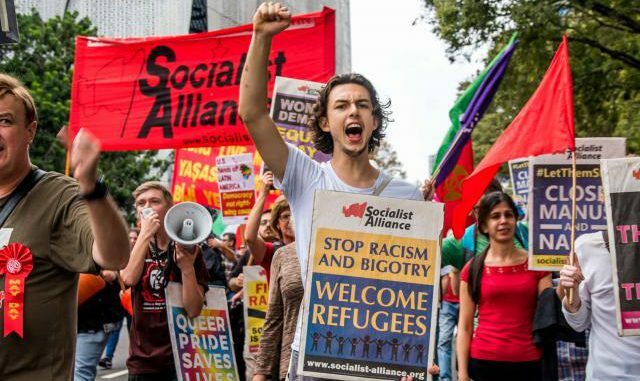 l Socialist Alliance renewed its position of freedom for all refugees and for an end to deportations. Conference voted to support World Refugee Day on June 22.
l Delegates condemned Howards war budget and encouraged Alliance branches to continue building the campaign launched in recent weeks with meetings, speakouts and an Alliance broadsheet. l The incoming Alliance national executive was elected on the basis of a constitutional change ensuring that non-affiliated members have 11 out of 21 positions. The change was moved unanimously by the outgoing NE. l Conference adopted a large number of new and expanded platform policies, with further suggestions forwarded to policy working groups. l For full details of all decisions, visit www.socialist-alliance.org. CONFERENCE marked the beginning, not the end, of many of the debates within the Socialist Alliance. The greater involvement of non-affiliated members was a significant step forward. But the resolution sponsored by many of them left much unsaid or vague. How would a united multi-tendency socialist party be different from the Alliance today? Will it be more or less open to those coming from outside the affiliated, revolutionary groups? How will it relate to the crisis in Labourism? What kind of vision of socialism will it express in future publications? None of these questions is settledand nor should they be, for the Alliance is still very much a work in progress. It is now up to all Alliance members to build the party and solve some of these arguments through practice and comradely debate. The ISO welcomes the increasing collaboration on the left. Hundreds of thousands of workers and students are looking for alternatives to neo-liberalism, war and racism. Much of what the left has to offer is held in common. Together, we can make a bigger impact in the battle of ideas and in the campaigns and struggles on the streets. The ISO will continue to argue for a revolutionary alternative to capitalism and the need for a revolutionary party to lead the fight for an overthrow of this current, rotten system. At the same time, we shall also argue that the Alliance must try to bring together the broadest leftfrom revolutionaries to recent ALP supporters – to strengthen the weight of the left in Australian society. The Alliance will succeed if it can offer a viable and accessible alternative to the hundreds of thousands disgusted with Labor but not yet convinced of the ideas of the existing far left. Concretely, that means organising against Howards khaki budget and for solidarity with the construction unions, and preparing for a bigger socialist intervention in the next federal election. Latham talks tought but will he fight?